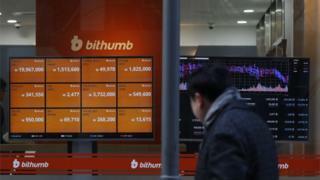 Seoul-based Bithumb said that 35bn won (£24m; $31.6m) worth of cyber-cash had been "seized" overnight, adding that it would fully compensate affected customers. Last July, it acknowledged an employee's PC had been hacked - exposing users' personal details. South Korea's spy agency later accused North Korea of being responsible after the stolen information was used to carry out scams. "Some crypto-currencies valued [at] about $30m was stolen," it posted in a since deleted tweet. "All deposit and withdrawal services will be stopped to make sure [of our] security... We are providing compensation... Bithumb urgently asks our valuable customers not to deposit any funds into Bithumb wallet addresses for the time being." The firm provided a Google-shortened link with further information, but it appears to have been blocked by the search firm for unspecified reasons. An earlier post on Bithumb's Twitter account reveals that it had announced that a database upgrade was being carried out as part of a security update late last week. It added that it had transferred assets to a "cold wallet" - a term used to refer to external storage unconnected to the internet - as part of the process. However, it is unclear whether this is linked to the reported theft. The Yonhap news agency has reported that police officers have launched an investigation and collected records from computers at the company's headquarters. The incident comes just over a week after another South Korean crypto-currency exchange, Coinrail, reported that it had been the victim of a separate attack in which hackers had stolen 40bn won worth of virtual coins. Bithumb is, however, the bigger of the two operations, and represents the world's sixth busiest crypto-cash trading platform, according to the news site Coindesk. At the time of writing, one bitcoin was trading at $6,626.19 (£5,035) - representing a 1.4% drop from its level before news of the heist spread.